Eating Well and Fueling Your Body: Where to Start? When the food offer is abundant, it can sometimes be difficult to make choices and even more challenging to make the right ones. While the food industry is trying to make money offering products that are already prepared and processed, Canadians’ health is deteriorating. 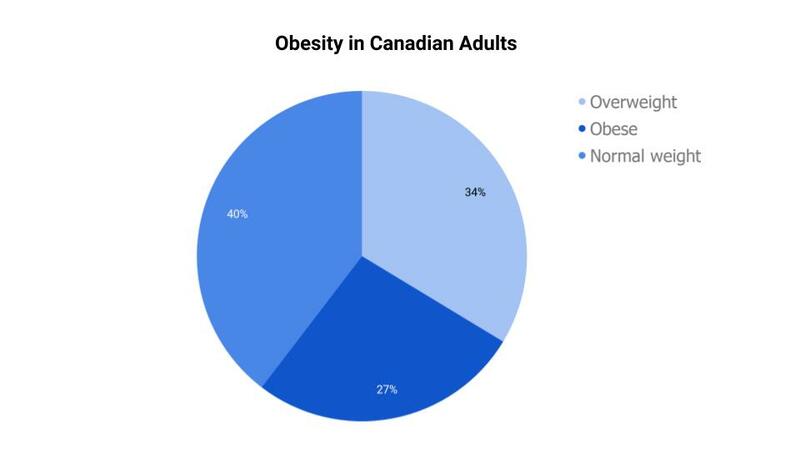 More than one in three Canadians is overweight and one in four is obese. If you are in the 60% overweight population, you are at higher risk of developing certain diseases such as type 2 diabetes, prediabetes, cardiovascular disease, sleep apnea, arthritis, osteoarthritis, etc. The good news is that if you are in any of the higher risk categories, you are in a position to make positive changes! Before you embark on the latest miracle diet, start small and build up progressively with victories. Eat mindfully to fuel your body! Water is the most important chemical compound in the human body, as you are composed of 60% water, more or less depending on your body composition. Indeed, the water in the body is used to remove waste and is filtered by your kidneys. It helps prevent constipation, lubricates your joints and more. Drinking between 2-3L of water per day is normally sufficient. Needs can change if you exercise or sweat. These needs may also change depending on your health status: fever, diarrhea, if you are pregnant or breastfeeding. Always carry a bottle of water with you, drink before you feel thirsty. Being thirsty or slightly dehydrated can make you feel hungry when you are just thirsty. Ensuring that you are well hydrated at all times can help reduce cravings. You'll know that you're drinking enough if your urine is light yellow and that the feeling of thirst is not felt too often during the day. Fruits: choose apples over applesauce for example to benefit from a better fibre intake, avoid dried fruits that contain a lot of sugar and often, added sugars. Make sure you have at least one serving of vegetables for lunch and dinner; these should make up at least half of your plate! Eat nutritious snacks and avoid pre-made bars or pre-packaged 100+ calories snacks that contain little nutritional value. Enjoy eating, discover new flavours and recipes, eat a variety of foods and above all, listen to your body and avoid excesses! If you have any health problems, consult a healthcare professional before making any changes to your diet. Your condition may require special care. If you are a Dialogue member, talk to a professional about it now. *The World Health Organization recommends that no more than 10% of the energy consumed as sugar should be ingested. For example, an adult consuming 1700 Kcal per day shouldn’t exceed 45 g or 3 tablespoons of sugar. **Favor monounsaturated and polyunsaturated fats, such as: olive oil, avocado oil, avocado, nuts and peanuts as well as omega-3: hemp and flax seeds/oils. Limit the consumption of saturated fats: animal fat, coconut oil, butter, use them in moderation for cooking. Soy, sunflower and corn oils containing omega-6 instead are not a bad choice, but we have enough omega-6 in our diet. Choose other oils to promote variety. Avoid trans fats, which are more often found in processed/industrial products. A medium fruit or half a cup of berries with about fifteen nuts or 15 g of nut butter or 30g or a portion of light cheese. Half a cup of low-fat cottage or low-fat Greek yogurt with half a cup of fruit (add cinnamon for taste). Homemade muffin: take any muffin recipe, use whole grain flour and replace the fat with the same amount of 0% Greek yogurt and add only 25-50% of the amount of sugar listed. Raw vegetables with 1-2 tablespoons of humus. Roasted chickpeas: take a can of chickpeas, drain and rinse, then put a little oil and seasoning (curry, Italian spices), then bake in the oven at 200ºC (400ºF) for 30 to 40 minutes.